What does it take to have a smile on your face the day you die? In this episode I pay a tribute to my Mom, Margaret Wyatt, who died 4 years ago in her own home, filled with joy and love. 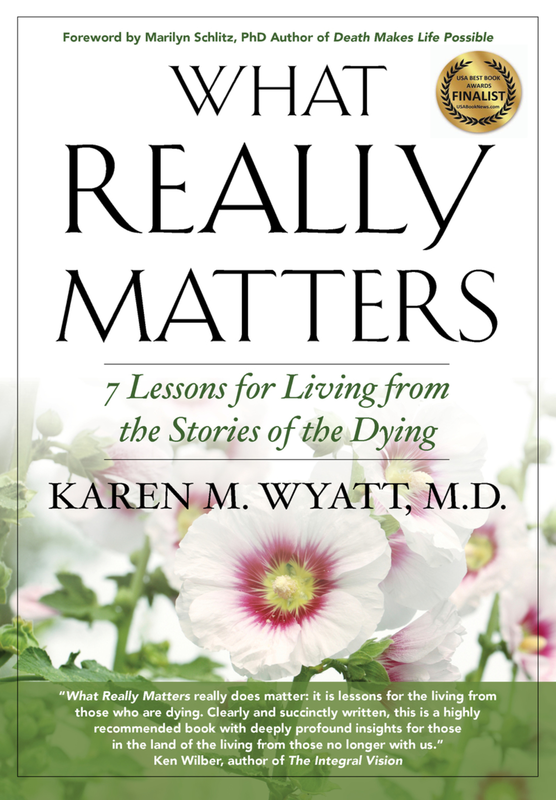 I’ll share the lessons I learned from her death about how each one of us can “Die Happy”! This podcast is sponsored through the EOLU donation page at Patreon.com/eolu. By contributing just $1 or $2 per month you can help support the podcast and the End-of-Life University Interview Series. If you become a supporter I will happily promote your book, website, cause or organization on a future episode of the podcast! Michelle Holmes – who has asked that I promote a favorite cause of hers: The Still Place. The Still Place is a charitable organization providing rest, renewal and re-creation to families living with serious illness in hope of fostering resiliency, empowerment and self-determination. We provide free of charge vacations, uniquely planned and lovingly facilitated for families who find it difficult if not impossible to get away, plan and experience the healing restorative properties of a family vacation. Go to their website at www.thestillplace.org to learn more! Holly Pruett – who is the founder of Death Talk Project. Death Talk Project organizes workshops, rituals, Death Cafes, monthly movie nights, and other events in Portland, Oregon. Join in for useful, honest conversation about how we die, how we mourn, and how we care for and remember our dead. Holly also created the community event Death OK: Let’s Talk About It and Death Talk Project grew out of that event. Learn more at www.deathtalkproject.com. My Mom died four years today, on the day I am writing and recording this episode, and I had the privilege of being at her bedside for the last 5 days of her life. She was happy and joyful and filled with love as she took her final breaths and she inspired me to want to teach other people how to die happy too. Mom was in very frail health for the last 5 years before she died and had become housebound as a result. She only left her home a handful of times during those years, but she received help from a friend with grocery shopping, housework and laundry. Believing that she was going to die soon, Mom set about to plan and prepare for her own death, though she didn’t realize then that she would live for 5 more years. She created a Living Will (using Five Wishes), planned her funeral and burial (and paid for them), and gathered together all of the financial, insurance, and estate documents that she thought my brother and I might need after her death. She also talked about her own death, her end-of-life wishes, and how she imagined her own dying process. She made sure that both my brother and I knew what she wanted at the time of her death: to be in her own home, in her own bed, with me at her side providing care. And that is exactly what happened when she died. Her wishes were fulfilled because she had thought about them, planned for them and talked about them. Believe in something bigger than yourself. Mom always devoted her time to being of service to others. In her last years of life she spent every afternoon praying for people from the comfort of her reclining chair. Prepare for and talk about death. As already mentioned, Mom was ready in every possible way for her own death. Let go of attachments. She freed herself from some of the burden of material possessions by giving things away to her visitors for 5 years. Make amends with the past and with other people. Be satisfied with life just as it is. Make the most of whatever you have been given. My Mom is dearly missed but I am comforted by knowing that she was happy when she died. Her beautiful death inspired all of the work I have done in the past 4 years with End-of-Life University, Death Expo and this podcast. I’m passionate about helping everyone find a way to die happy! I wish you could have met her ….